Hoola bronzer has been heralded as one of the first bronzers to truly get it right: its matte finish and cool tone allows it to look like a natural tan instead of a glittery orange mess. The problem? It was one-size-fits-all but not actually catering to all skin tones in a flattering way. 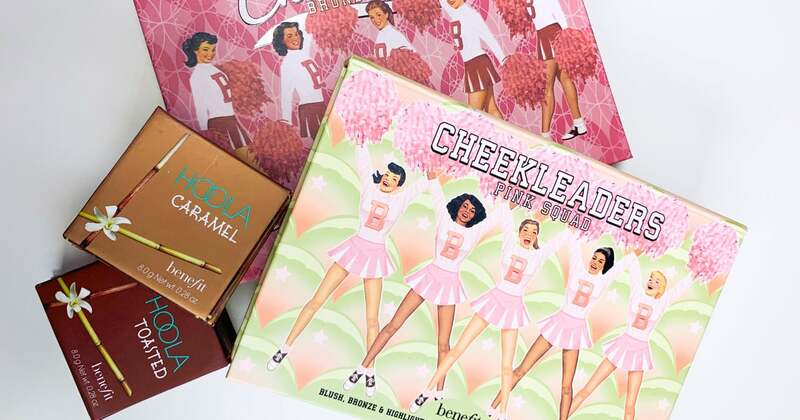 Benefit expanded the product to include a lighter shade for fair skin tones in 2017, and this month, at the request of fans, deeper skin tones will get theirs with Hoola Caramel and Hoola Toasted ($30 each). “I’ve worked with Benefit for years and always begged them for deeper shades of their infamous Hoola bronzer, and my prayers have finally been answered! I hope these additional shades are just the beginning,” said YouTuber and influencer Ellarie. Hoola Caramel will be included in one of two new cheek palettes: Cheekleaders Pink Squad and Cheekleaders Bronze Squad ($60 each). The palettes come with five full-size products including blush, bronzer, and one new palette-exclusive highlighter. Pink Squad is the rosier of the two and includes Galifornia, Coralista, and Dandelion blushes, the classic Hoola bronzer, and Tickle, a golden-pink highlighter, which will be available separately in September 2019. Bronze Squad includes Dallas and Gold Rush blush, the classic Hoola and new Hoola Caramel, plus a golden-pearl highlighter called Cookie, which will also be available individually in September. You can also purchase mini versions of each Cheekleaders palette. Mini Pink Squad ($30) includes GALifornia, Dandelion ,and Tickle; Mini Bronze Squad ($30) includes Hoola, Gold Rush, and Cookie. The palettes and Hoola bronzers launch Feb. 26, but keep reading for a first look at the new launches.